Battle was born in Neubrücke, Hoppstädten, West Germany, part of the Baumholder Army Military Community, and raised in Washington, D.C. and New York City. His mother was a homemaker and his father a U.S. army officer. Battle’s talent became apparent at the age of nine. After three years of studying ballet at the Jones-Haywood School of Ballet, he received a scholarship to The School of American Ballet where he studied until the age of fifteen under George Balanchine. That same year, Hinton made his Broadway debut starring as the Scarecrow in The Wiz. 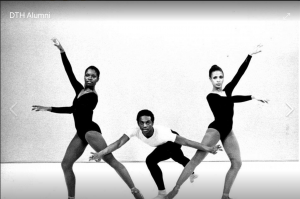 After performing on Broadway Hinton returned to ballet and become soloist with both the DANCE THEATRE OF HARLEM, under the direction of Arthur Mitchell, and the CHICAGO LYRIC OPERA BALLET, under the direction of Maria Tallchief.